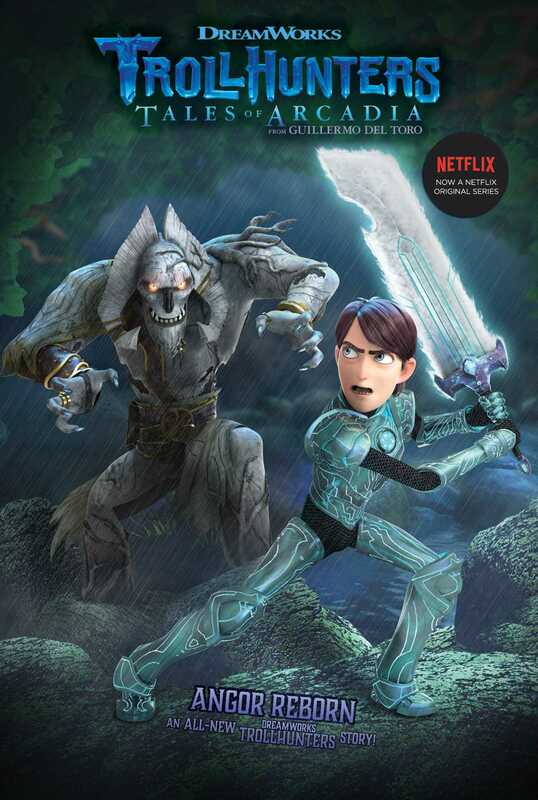 Jim faces off against Angor Rot in this all-new epic story based on the hit Netflix series Trollhunters—from the limitless imagination of acclaimed filmmaker Guillermo del Toro and DreamWorks Animation. When presented with one more task from Merlin, Jim Lake, Jr., isn’t too worried. How bad could bathing in a magical elixir be? It almost sounds soothing. Hopefully he’ll be able to relax and get away from it all. Oddly enough, it does transport him, just not in the way he imagined. Suddenly Jim finds himself in the cold, dark woods and he’s not alone. The recently resurrected Angor Rot is there with a score to settle. To make matters more complicated, Jim has suddenly grown taller, stronger, and is sporting some very Troll-like hair, eyes, and teeth. All of this leaves him questioning Merlin’s magic, trying to get a handle on his new body, and wondering how he’ll get away from Angor Rot. Talk about an awkward stage! This book includes full-color glossy inserts with images from the show! DreamWorks Trollhunters © 2018 DreamWorks Animation LLC. All Rights Reserved. Richard Ashley Hamilton is best known for his storytelling across DreamWorks Animation’s How to Train Your Dragon franchise, having written for the Emmy-nominated Dragons: Race to the Edge on Netflix and the official Dragons Expanded Universe bible. In his heart, Richard remains a lifelong comic book fan and has written and developed numerous titles, including Trollhunters (with Marc Guggenheim) for Dark Horse Comics and his original series Scoop for Insight Editions. Richard lives in Silver Lake, California, with his wife and their two sons.